Seattle based artist, Chris Jordan, shows us an arresting view of what Western culture looks like. Best known for his large scale works depicting mass consumption and waste, particularly garbage, he has been called “the ‘it’ artist of the green movement.” His supersized images picture some almost unimaginable statistics — like the astonishing number of paper cups we use every single day. Caps Seurat, 2011 60x90" in one panel, and 88x132" in 3 panels Depicts 400,000 plastic bottle caps, equal to the average number of plastic bottles consumed in the United States every minute. sVA: As a whole, standing back and looking at your work, there seems to be a minimal appearance. Are you influenced by minimalism and/or non objective art? CJ: I would say so. I feel like I am influenced by the lots of different genres of art including the color field, minimalism, and various forms of photography as well. But really, what I am trying to do with all of those things actually is to use them as a tool for making a point, and so in that way although I feel like I am influenced by those genres I feel like to turn them on their head a little bit- at least that is what I am trying to do. sVA: You take photographs of small quantities of waste and then make digital composites that add up to the actual amount of things we consume, whose message comes into play in closer examination. How does your audience respond to this effect in exhibitions? CJ: It’s always a fulfilling and a rewarding experience for me to see people because if the way the prints are supposed to work, and the way that they actually end up working, you should be able to stand back at a distance and see something that is quite attractive or at least it is none threating. So you see what looks like a big ocean or you see something like 6 giant orange rectangles that will appear like a piece of minimalist modern art. So people walk up close to them, and it’s funny when you get up really close that you see all of the fine details that the work is actually made up of, and at that point people usually show a spark of interest- you can see their eyes get really big and that is when they call their friend over and say “Hey you have got to come look at this!” In that process they are comprehending the number of the things that they are seeing without really knowing what is going on and then only in the end when they go over and read the panel on the wall do they get the shock of what the piece actually represents. Venus, 2011 60x103" in one panel, and 8x13 feet in three panels Depicts 240,000 plastic bags, equal to the estimated number of plastic bags consumed around the world every ten seconds. sVA: How do you implement your projects? They must be incredibly time-consuming and challenging from a practical point of view. CJ: Most of the pieces in the Running With Number Series I did the entire process myself and it is really time consuming and I realized as I got to the end of the body of work that I was doing a lot of really tedious work that I really did not need to do. There is not a lot of artistic input in the process. For example, walking down a commercial street in Seattle and collecting 600 plastic bags and then photographing every single one of them and then in 10 different positions and then cutting all of those bags out from their different backgrounds and then comparing them to be built into a giant image of hundreds of thousands of plastic bags. 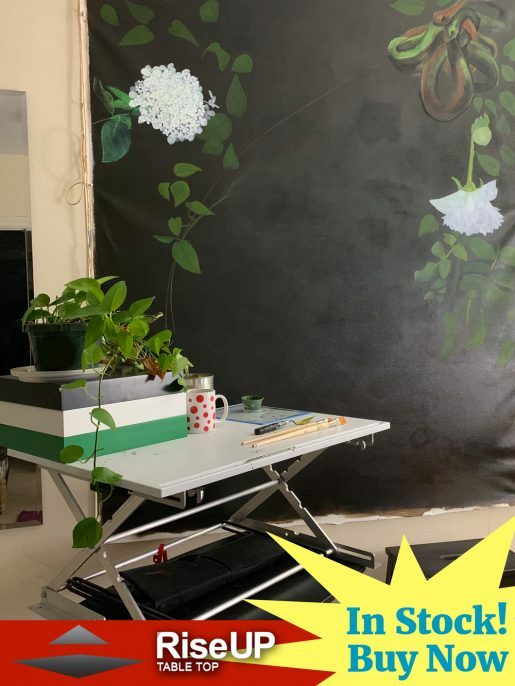 So lately, I have been working with an assistant to help me do the really tedious stuff, but most of the images that will be in the Art Center Exhibition were made just by me. sVA: How important is it for the viewer to feel the personal connection in art today? CJ: That’s really the challenge- to feel a personal connection to the world. That is really what the whole body of work is aimed at. It’s the question of “Do I matter?” because everyone of use is 1 in 7 billion are number that is so tiny it seems incomprehensible. It’s really hard for anyone to feel like anything we do makes a difference in the world, and I think that is the big question facing humanity right now. How do we act in a way that is empowering and empowered and how do we begin collectively acting as if we all matter? Each one of us has a persuasive argument going inside of their heads and I don’t matter, my vote does not count and whatever tiny little thing I do on behalf of our world is going to be wiped out by the notorious behavior of entire continents. sVA: Is that part of the reason why you started using photomosiacs to put everything into perspective? CJ: Yes, I am trying to raise the question – the enormous scale. When you face the enormous scale of what is going on in the world, whether gigatons of carbon we are emitting or the millions of cellphones that we are discarding you start facing the scale of our world and you’re overwhelmingly faced with the tininess of each one of us. It’s a paradox because on one hand each one of us doesn’t matter, and on the other hand the reason why we got into this disaster we are into now is because of the actions of hundreds of million of individual people behaving like they don’t matter. sVA: Would you consider yourself more of an anthropologist, or photo journalist, exposing the ills of society, rather than an artist? CJ: That is a really interesting question. I find it interesting to categorize the process of my work because it really doesn’t fall into a category. I think it is funny and kind of annoying that people label me as an Environmental Artist because almost none of it has anything to do with the environment. I like to think of myself as a cultural activist. Am I an artist or an activist? I almost don’t think of myself as either one. When I think of activist- a traditional activist, it is kind of finger wagging and itchy and kind of one-dimensional. Activists particularly fail to see the irony in what they are saying, like a whole bunch of green movement people all drive their SUV’s to a rally against petroleum. So I try not to be an activist like that, but then I also think of artists are living in their own world. The art world is this kind of thing that is detached from the rest of the world. A lot of artists have the tendency to (especially now days with the Modernist Movement) stand back and laugh at the world in this ironic and really detached way and I don’t want to be like that either. I believe very deeply in an urgent need right now for engagement. On behalf of everybody, whether our teachers, our filmmakers, our artists, or whoever, I try to walk the line in-between those things. sVA: Why do you utilize iconic images instead of non objective forms in your work? CJ: The challenge, the underlying goal that I have is to draw the viewer in. I want the viewer to walk up close and get hit over the head with a sledgehammer, and so I am always trying to figure out how to draw the viewer in and how to build as many layers of Meta message in each image. 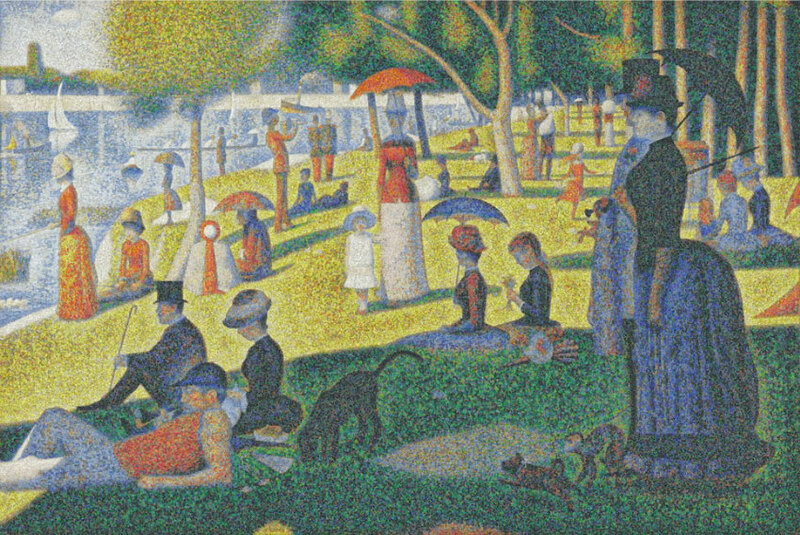 So for example with the La Grande Jatte image (A Sunday Afternoon on the Island of La Grande Jatte- 1884 by Georges Seurat), that is a painting that was done just at the beginning of the Industrial Revolution that is essentially a snapshot of what it looked like for people to take a leisurely stroll in the park back before there were giant parking lots of SUVs and plastic coolers filled with plastic knives and plastic forks and spoons, and Frisbees and Nike shoes and all the stuff that goes into a Sunday at the park now. It was also one of the first pieces that I did in that series and it is sort of a pawn on Pointillism. With the Venus picture, the one I did with the number of plastic bags used around the world in 10 seconds, it’s the iconic painting of the Birth of Venus by Botticelli. 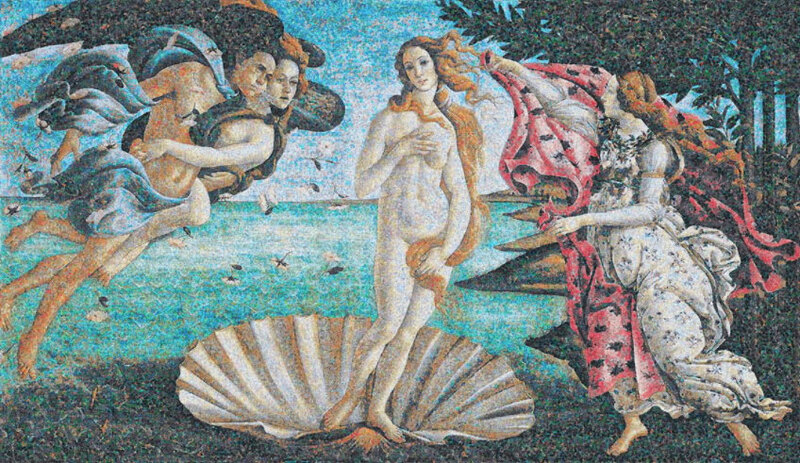 I used that image because Venus is the goddess of love and in that story in that painting she was birthed from the ocean and so the ocean is her mother and so she in a way represents our love for Mother Earth or our earthly love. There is also a general interest, a beauty, and a recognition aspect in those iconic paintings that helps bring the viewer to the conversation. sVA: Do you work with any medium other than photography? CJ: Right now, I am switching mediums actually and directing a film that is just about the most difficult and scary thing I have ever done but it is really exciting as well. sVA: Can you tell us what you are currently working on, or what subject is currently inspiring you? CJ: Right now I am really emerged in my Midway project. 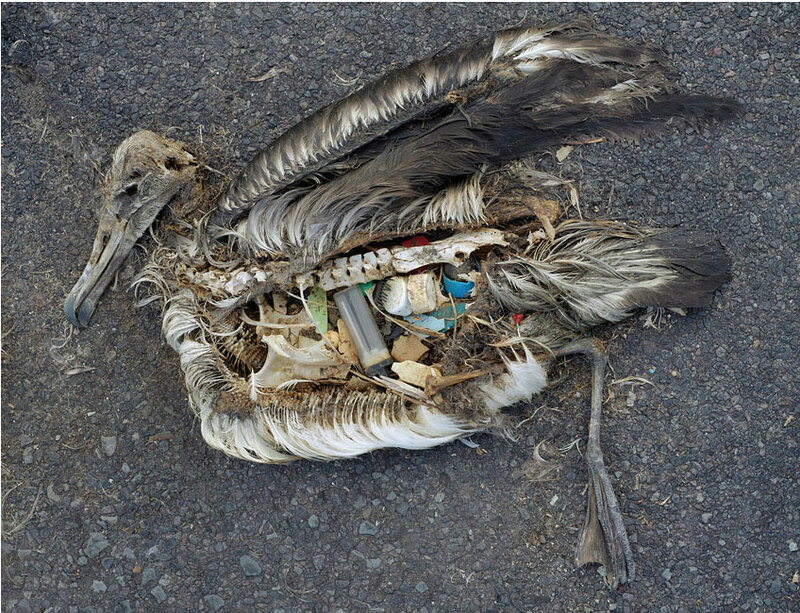 I have been going out to Midway Island in the middle of the Pacific Ocean for a couple of years now, I just made my sixth trip out there and photographing dead baby Albatross bodies that are filled with plastic. This project is ongoing and all of the pictures you will see in the ACS exhibition came from the very first trip there and I have gone back numerous times since then and have been presented with the horror of tens of thousands of dead baby birds but also this ecstatic beauty of being in an environment surrounded by a million of these magnificent birds who have no fear of humans.